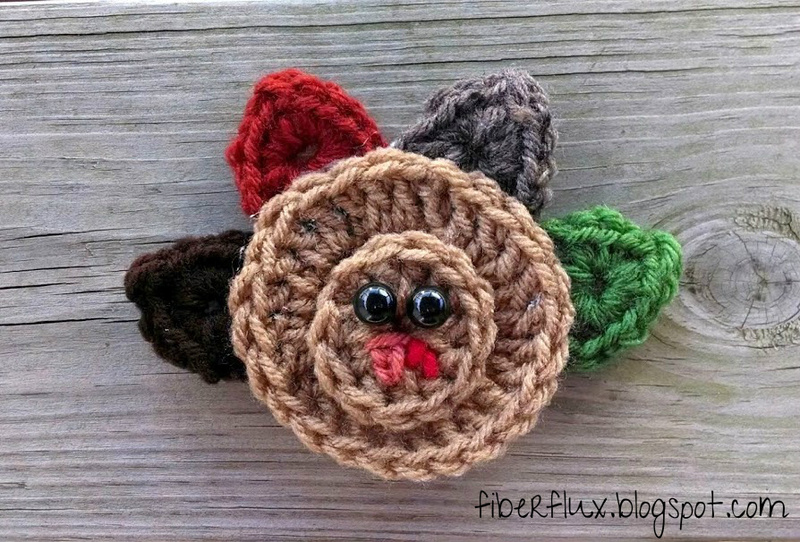 Fiber Flux: Free Crochet Pattern...Easy Turkey Applique! 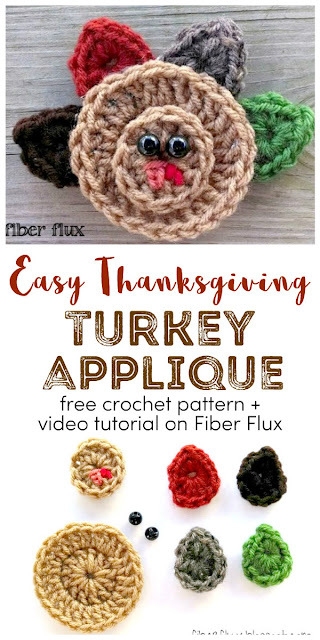 Free Crochet Pattern...Easy Turkey Applique! 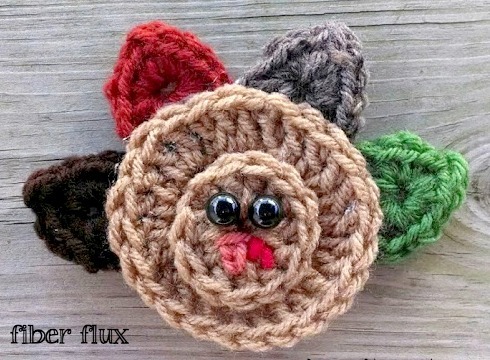 This cute turkey makes a festive addition to a shirt, headband or other garment. If you're feeling adventurous, you can even make one for each person's place setting at the Thanksgiving feast. Easily made with two circles and four (or more) feathers and finished off with two cute button eyes. Worsted Weight Yarn of your choice (Yarn shown is Red Heart Super Saver in "Warm Brown" "Coffee" and Lion Brand Vanna's Choice in "Kelly Green" "Brick" and "Barley"
Ch 6 and join with a sl st to form a ring. Round 1: Work 12 dc into center of ring. Round 2: Ch 2. Work 1 dc in first stitch. Work 2 dc in next stitch and in each stitch around entire circle. Join with sl st to close round. With tapestry/yarn needle, stitch the beak and wattle (red part), tie on back, weave in ends if needed. Round 1: In the center of the ring, work 6 dc, 4 sc, 1 tr, 4 sc. Join with a slip stitch to close leaf and fasten off. Weave in ends. Seam or glue parts together, making sure right side of work is facing out. Start by attaching feathers to back top edge of body. Attach head to center of body. Attach two buttons for eyes. Affix finished applique to shirt, headband, etc. by sewing or fabric glue. That's really sweet, thank you. You're welcome, I had fun making it! 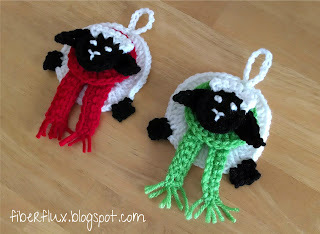 These would make adorable napkin rings, just attach them with a long tail yarn and tie on or with some chain stitches. 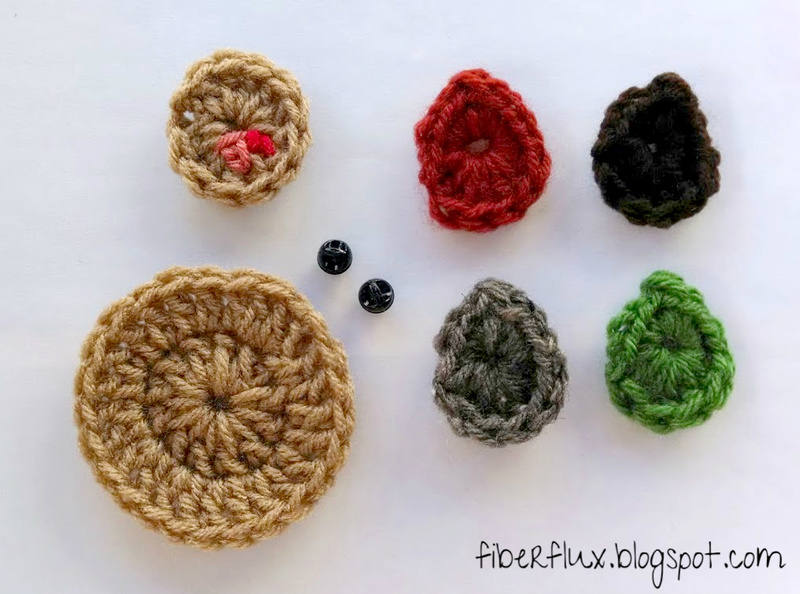 Thanks for the pattern, I better get busy!